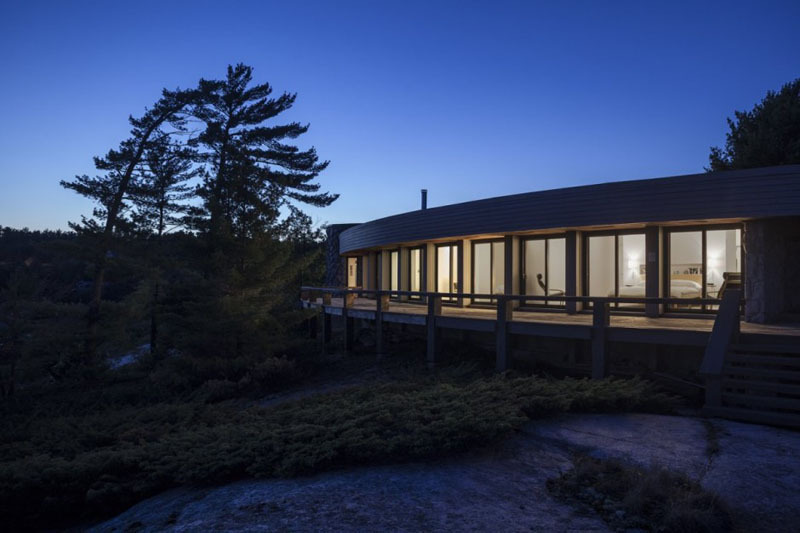 Altius Architecture have given this 1970’s lakeside home in Parry Sound, Canada, a modern house renovation. A semi-circle floor plan with an open layout are used along with, clean white interiors and various lighting to keep the house light and airy. Stepping inside the house, the front entrance is bright and welcoming with the use of down lighting on a white brick wall, and a skylight. Selected art pieces are displayed by spot lighting, and a white shelf. Entering the hallway of the home, a small reading area has been created beside the fireplace with a concrete surround, that’s in the centre of the room. White built-in shelves above the fireplace provide a spot for decorative ornaments or storage. 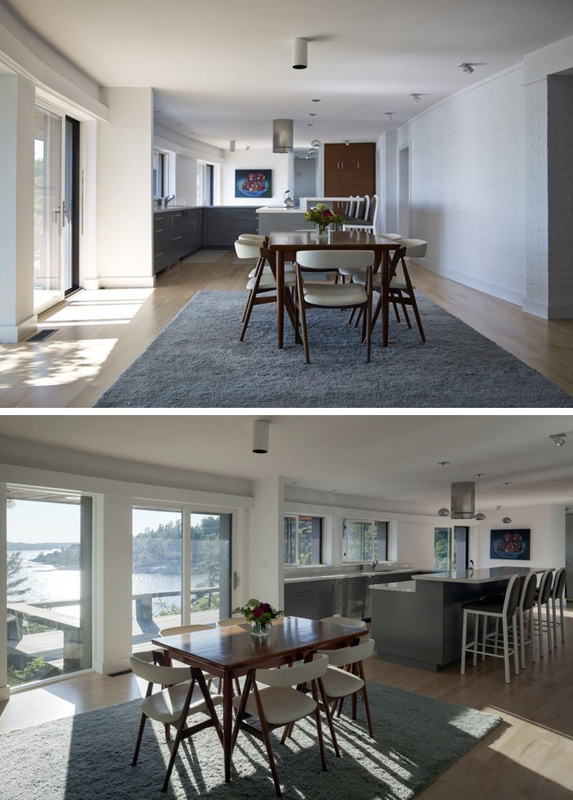 In the dining room, a wood dining set with white upholstered chairs is placed on top of a thick grey rug. Sliding glass doors in front of the table provide an excellent view, and lead to the outdoor balcony. Next to the dining room is the kitchen, with grey cabinets and stone countertops providing plenty of storage and work space. A built-in banquette at the end of the kitchen counter creates an additional and more casual dining area. 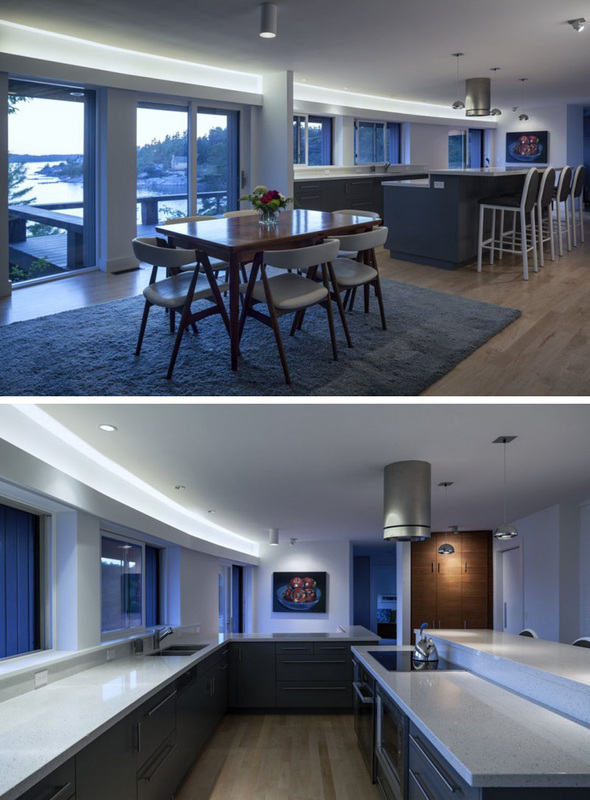 As day turns to night, hidden lighting above the windows and the glass balcony doors in the kitchen and dining area ensures that these rooms are always bright. In the living room, a grey upholstered L-shaped couch, and two red armchairs sit beside sliding glass doors that lead to the balcony. 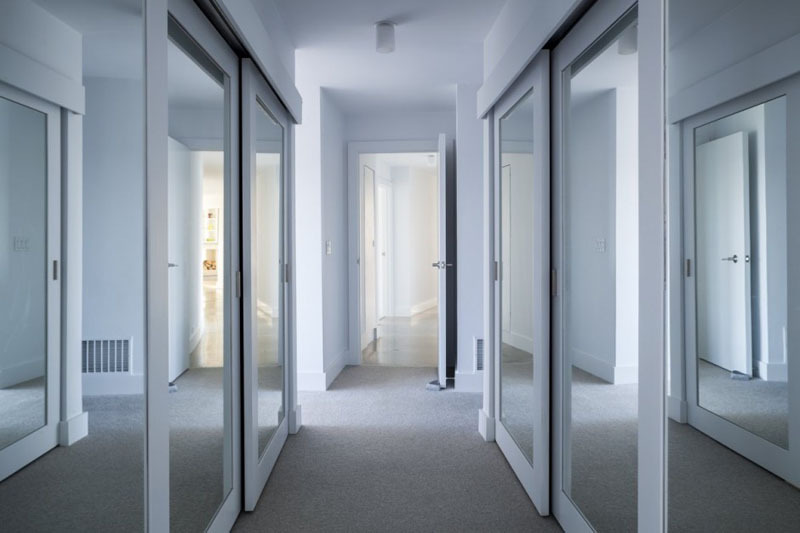 Leading to the sleeping quarters of the home is a hallway, and mirrored front closets guide you to the master bedroom. In the master bedroom, a built-in shelf above the bed provides an excellent space for books and small ornaments. 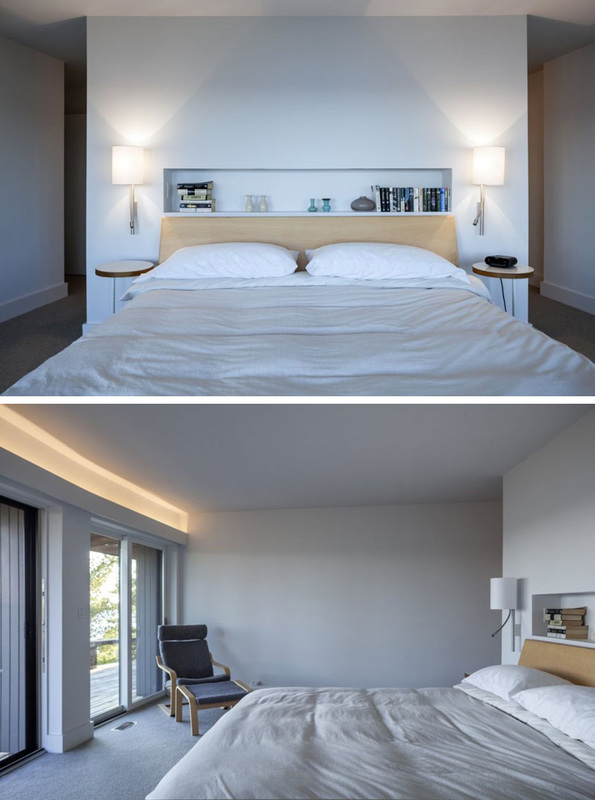 Two wall mounted lamps provide reading light and sit above two wood nightstands. For extra light, hidden lighting is used again above the sliding glass doors in this room. In the master bathroom, an undermount sink with dual faucets sits below a large mirror. A skylight in the ceiling makes the white room even brighter, while a glass shower surround allows the light to travel into the shower. 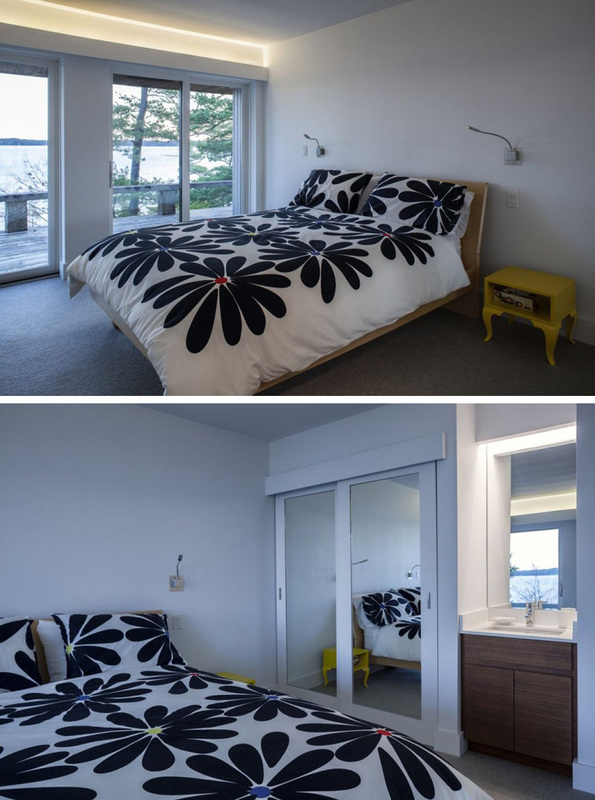 In the next bedroom, a large floral print duvet and yellow nightstand add a pop of color. A mirrored closet with sliding doors is placed beside a small sink with wood cabinets. Glass sliding doors with hidden lighting above lead to the balcony outside. 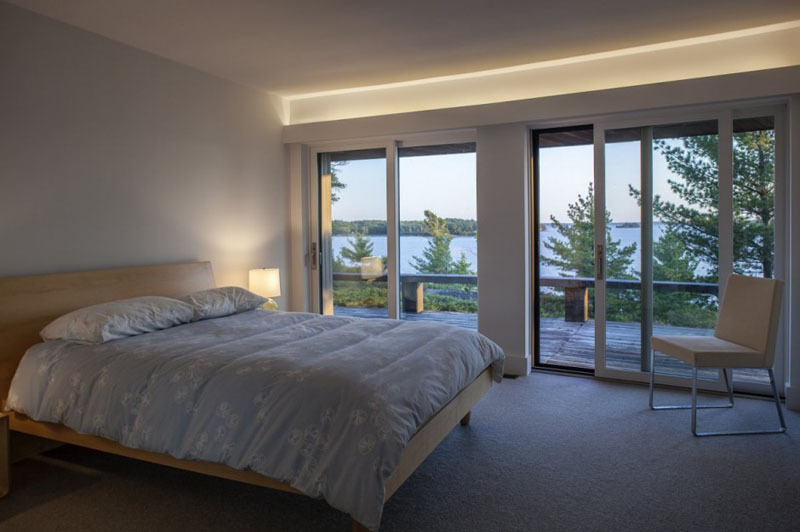 Going into the last bedroom, a wood framed bed sits beside a set of glass sliding doors and windows that make the view the focal point of the room. Hidden lighting is used again in this room above the doors. 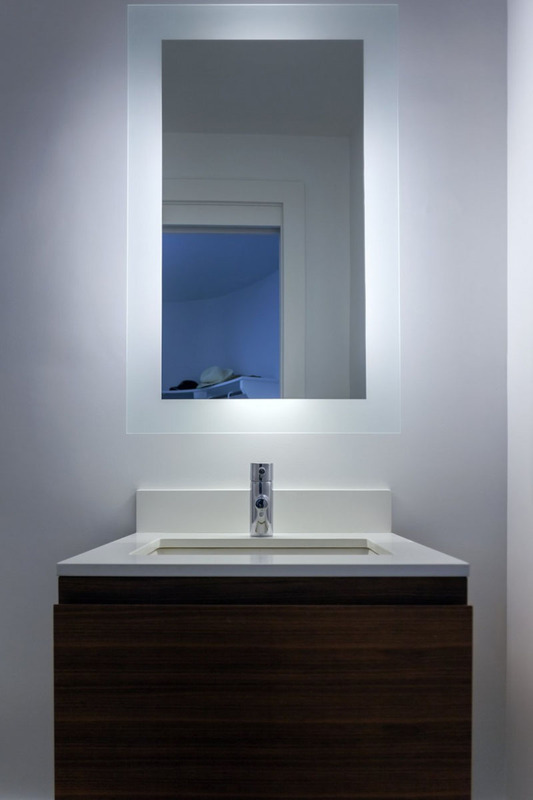 In the last bathroom, a white sink with wood cupboards sits below a back-lit rectangular mirror with opaque borders.